A recall has been issued on one form of the opioid overdose antidote Narcan. Some of the opioid overdose antidote Naloxone has been recalled by its maker, Hospira, over the potential presence of particulate matter, the Food and Drug Administration said Monday. 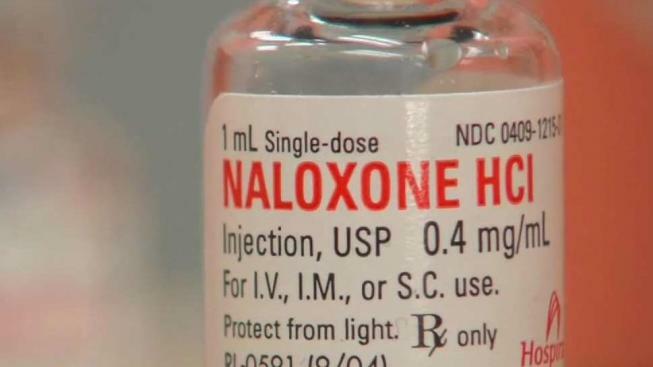 Two lots of Naloxone are being recalled because there may be "embedded and loose particulate matter on the syringe plunger," the FDA said in a notice. If injected with the medicine, a patient has a "low likelihood of experiencing adverse events ranging from local irritation, allergic reactions, phlebitis, end-organ granuloma, tissue ischemia, pulmonary emboli, pulmonary dysfunction, pulmonary infarction, and toxicity." The recall affects single-use cartridge units of Naloxone Hydrochloride Carpuject Injection with lot numbers 72680LL and 76510LL. They were distributed to wholesalers, distributors and hospitals in the United States, Puerto Rico and Guam from February 2017 to February 2018. Hospira has not received reports of adverse effects from the affected Naloxone. Pfizer, the parent company of Hospira, confirmed in a statement to NBC that there is no shortage, as Naloxone is also currently available in vials. Pfizer added that the recall does not affect any Naloxone products sold under the brand name Narcan, which includes a nasal spray that is available with a prescription and that many law enforcement agencies and hospitals use. Narcan is also available over the counter in most states. Hospira has notified wholesalers, distributors and hospitals of the contaminated lots, and it is encouraging others to discard affected lots, the FDA said. The recall affects an older version of the drug that may still be in atomizer kits that were distributed into communities. Those with older kits should contact the business or institution that distributed them and get replacements. "This is not a product for use by consumers. Training is required to use it appropriately," Pfizer explained. "Therefore, it is for use by medical professionals or first responders such as police officers who have been trained in its use."